Pour the balsamic vinegar in a small pan. Over medium-low heat, reduce by one-third, stirring frequently with a wooden spoon. Remove from heat and set aside. Brush the cut side of each peach with the olive oil. Place cut side down on preheated grill over high heat. Grill for approximately 2 minutes, or until just marked. Turn and grill 2 more minutes. Remove from heat. To serve, place warm peaches on individual serving plates, cut side up. Top each with a scoop of ice cream and drizzle with the balsamic reduction. Garnish with raspberries and mint, if desired. Melt the chocolate over a double boiler and allow it to cool to room temperature. Beat the egg yolks and sugar in the bowl of an electric mixer on high speed until light and lemon yellow in color. Reduce the mixer speed to low and add the olive oil in a slow, steady stream, as you would for a mayonnaise. Once the olive oil has been incorporated, add the melted chocolate, espresso, and liqueur. Mix on low speed until combined. In a separate bowl, whip the egg whites until they form medium peaks. Fold the whites thoroughly into the chocolate mixture. Divide evenly between 8 ramekins and refrigerate until set, at least 3 hours. To serve, garnish with sea salt, chocolate shavings and mint, if desired. Preheat oven to 350 F. Mix together apples, Meyer Lemon olive oil, sugar, cinnamon, salt, and Red Apple Orchard balsamic vinegar, and pour into a baking dish. Next mix brown sugar, oats, flour, and butter with your fingers until just combined. Top the apples with the topping and bake for 1 hour. While the crisp is in the oven, bring the Neapolitan Herb balsamic vinegar to a simmer and reduce, stirring occasionally, until a thick syrup forms. When the crisp is golden brown, remove from oven and drizzle reduction on top. To make the crumble, crush the graham crackers in a large ziplock bag with a rolling pin or mallet. Pour the crumbs, sugar and olive oil into a bowl and stir until fully combined. Pour into a 9″x13″ casserole dish and press into an even layer. Bake for 10-12 minutes, until light brown. Set aside and allow to cool. To make the filling, beat the cream cheese using an electric mixer or stand mixer until creamy. Add the powdered sugar and continue to mix. Add the lemon juice and beat until incorporated. Add the milk and mix until combined. Fold the whipped cream or Cool Whip into the cream cheese mixture. To assemble the desserts, spoon some of the crumble into the bottom of each serving glass. Next, add a scoop of the cheesecake filling. Place a layer of strawberries on top of the filling and press down lightly to flatten. Add another layer of cheesecake filling followed by another scoop of the graham cracker crumble. Add a layer of blueberries, top with a dollop of the cheesecake filling and garnish with more strawberries and blueberries. Depending on the size of the serving glass, this recipe makes 6-7 mini desserts or 4-5 moderate size desserts. This makes a great dessert topping served warm over vanilla ice cream or a brunch-worthy addition to pancakes and waffles. Toast the walnut pieces in a dry skillet over low heat for about 10-12 minutes, flipping occasionally. Set aside. In a large bowl, toss the apple cubes with the cinnamon and a pinch of salt. Toss well to evenly coat. Heat the olive oil in a large non-stick skillet over medium-low heat. Add the apples and cook for about 12-15 minutes, stirring occasionally until the pieces begin to soften. Some of the chunks will become softer faster and begin to break down. This is fine as you want some pieces to become saucy while some pieces remain firm. When the apples are done, remove from the heat, add the balsamic vinegar and the walnuts (reserve 1/4 cup of walnuts as a garnish if desired.) Toss gently to coat. Position the racks in the center and bottom third of the oven and preheat to 350 degrees. Lightly oil two 9-inch round cake pans with Blood Orange Olive Oil, sprinkle evenly with flour and tap out the excess. Sift the flour, sugar, baking soda, cinnamon, and salt into a bowl. In another bowl, stir the bananas, pineapple, Blood Orange olive oil, eggs and vanilla until combined. DO NOT use an electric mixer. Pour into the dry mixture and fold together with a large spatula, just until smooth. DO NOT BEAT. Fold in the pecans. Spread evenly into the pans. Bake until the cake springs back when pressed in the center, 30-35 minutes. Transfer the cakes to wire racks and cool for 10 minutes. Invert the cakes onto the racks, turn right side up and cool completely. To make the icing, beat the cream cheese and butter with an electric mixer on high speed, until combined. On low speed, gradually beat in the sugar, then the vanilla, to make a smooth icing. Trim the top of the cakes for a smooth, even surface. Place one cake layer on a serving platter and spread with 2/3 cup of the icing. Top with the second layer (upside down) and spread the remaining icing over the cake top and sides. The cake can be prepared up to one day in advance and stored, uncovered in the fridge. Let stand at room temperature before serving. Place the blueberries in a sauce pan over medium heat along with 2 tablespoons of water, the lemon zest, and honey. Simmer for approximately 2 minutes, then allow the mixture to cool slightly. Add the yogurt and olive oil and whisk until blended. Pour into 12 popsicle molds and freeze. Line a baking sheet with parchment paper. Arrange baguette slices in a single layer on the baking sheet. Place under broiler until golden, about 2 minutes. Turn each slice over and broil another 2 minutes. Turn off broiler. Turn each slice over again and drizzle with olive oil. Push a chocolate piece into the center of each slice and return baking sheet to oven for 2 more minutes. Remove from oven and lightly sprinkle each chocolate piece with sea salt. Just before serving, stack the basil leaves on a cutting board and roll them vertically into a loose cigar shape. Thinly slice across the roll to make a fine chiffonade of basil. Portion the strawberries and their juices among four small bowls and scatter with the basil to garnish. - Serve the strawberries over grilled or toasted pound cake. Garnish with a dollop of crème fraîche. - Put the berries on split biscuits, top with whipped cream and scatter with the basil. - Layer the berries with ice cream or yogurt for a parfait. Garnish with the basil. - Spoon the strawberries over a grilled or roasted peach half. - Use the berries as a filling for crêpes or a topping for waffles. Combine the flour and remaining dry ingredients and spices in a medium bowl. With an electric beater, cream the sugars, eggs, olive oil and vanilla for 3 minutes. Slowly add the flour mixture to wet mixture, just until combined. Fold in the apples and pour into bundt pan. Bake for 35 to 40 minutes, until toothpick comes out clean. Allow to cool. Serve with vanilla ice cream and warm caramel sauce if desired. Lightly grease two 9-inch cake pans, one muffin pan, or one 13x9-inch pan with Blood Orange olive oil. Mix together all the dry ingredients in a large bowl. Thoroughly mix together the liquid ingredients in a separate large bowl. Add the dry ingredients to the wet and mix using a hand or stand mixer on low. Pour the mixture into the prepared pans. Bake for 30 minutes (cupcakes will take about 15 minutes) or until a cake skewer inserted in the center of the cake comes out clean. Cool for 20-25 minutes before removing the cakes from the pans to cool completely. Place the chocolate chips in a heat-proof bowl. Heat the cream in a sauce pan over medium heat until just about simmering. Pour the cream over the chocolate and allow to sit for five minutes. Gently whisk the chocolate and cream until smooth and free from any lumps. Add the Blood Orange olive oil to the chocolate and whisk to thoroughly incorporate. Allow to cool until it reaches a spreadable consistency. Gently spread the slightly cooled ganache over the the completely cooled cake. Serve with lightly sweetened whipped cream and a tangerine segment as garnish, if desired. Heat the cream and salt in a heavy bottom sauce pan over low heat until it just begins to steam. Do not allow it to simmer. Pour the cream over the chopped chocolate and allow it to sit for 2-3 minutes without stirring. Then stir gently until all the chocolate is melted. Add the balsamic vinegar and stir to combine well. Cool the ganache to room temperature and then place the bowl in the refrigerator, covered until it is cold and can be scooped and formed into balls. Cover a baking sheet that will fit in your fridge with a sheet of parchment paper. Take 1 teaspoon of cold balsamic ganache and quickly roll between your hands to form a ball. If you spend too much time trying to get the shape just right, you'll begin to melt the ganache and it will be a mess! Place the balls on the prepared baking sheet and put back in the fridge or freezer to firm up. 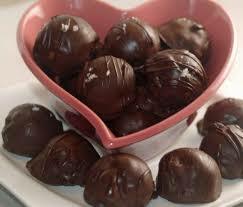 When the truffles are firm, roll in cocoa powder or dip in melted chocolate. Store in single layers, separated by parchment or wax paper in a sealed container in the refrigerator. They can be taken out and served at room temperature. Using a stand mixer with whisk attachment, beat egg yolks and sugar until thick, about 5 minutes. Add mascarpone to the egg yolks and beat until smooth. Add 1 tablespoon of espresso and one tablespoon of balsamic vinegar and mix until thoroughly combined. In a shallow bowl, mix the remaining espresso and balsamic vinegar. Briefly dip each ladyfinger into the espresso mixture. Don’t allow them to soak too long or they will fall apart. Place the ladyfingers on the bottom of a 13 by 9 inch baking dish, breaking them in half if necessary in order to fit the bottom. Evenly spread 1/2 of the mascarpone mixture over the ladyfingers. Arrange another layer of soaked ladyfingers and top with remaining mascarpone mixture. Cover with plastic wrap and refrigerate for at least 2 hours or up to six. Before serving, sprinkle the top with the chocolate shavings. Super simple and delicious, this cake has a bright lemon flavor and moist crumb due to the addition of our Meyer Lemon olive oil. Grease a 9"x9" baking pan with lemon olive oil. In a large bowl combine the sugar, eggs, yogurt, vanilla, and lemon olive oil. Whisk until pale and well combined. In a separate bowl, whisk the dry ingredients together and add to the wet ingredients. Portion the dough into two equal parts, and then shape each into a long rectangle approximately 1/2" thick, by 4" wide, by 12" long. Bake each sheet in the center of the oven for approximately 25 minutes until the log is just tuning golden brown. Remove from the oven and allow to cool slightly. Using the sharpest knife in your possession, slice the log into one inch long cookies - for approximately 12 cookies per log. Return the cookies to the oven, cut side up, and bake again until golden brown and crisp, about 10-15 minutes. 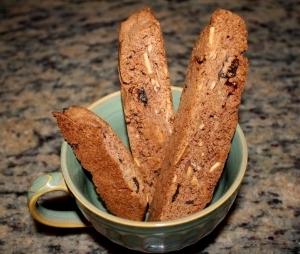 Makes approximately 24 generously portioned biscotti. About an hour before grilling, drizzle peaches with balsamic vinegar and sprinkle liberally with brown sugar. Preheat grill to medium high heat, then lightly coat with a little olive oil. Place peach halves cut side down on grill. Cook for 3 to 4 minutes, then turn over so that the cut side is facing up. Sprinkle with more brown sugar. Cook for 2-3 more minutes or until soft when poked with a fork. Place two peach halves on four individual plates and garnish with basil, if desired. Top with a scoop of ice cream or whipped cream…or both! Top your favorite cakes, brownies, fresh berries and ice cream with this citrusy topping! Whip the cream and olive oil with the confectioner's sugar with a mixer or in the blender until soft peaks form. Top your favorite dessert with whipped cream before serving. Working with one lady finger at a time, dip a total of 8 cookies into the espresso mixture per layer. Arrange the lady fingers side by side with a small amount of room between each, over the bottom of a two to three quart dish. Spoon 1/3 of the mascarpone mixture over the cookies and gently spread to cover. Sprinkle with ground chocolate. Repeat this process two more times finishing with a layer of mascarpone and ground chocolate on top. Cover the tiramisu with plastic and refrigerate at least 6 hours. Grease an 8" x 8" square baking pan. Combine butter, Persian Lime olive oil, sour cream, lime juice, lime zest and sugar in a 2 quart sauce pan over medium heat for 5 minutes or until sugar is dissolved and mixture boils, stirring constantly. Continue boiling over medium heat until a candy thermometer reaches 238°. Remove from heat, add marshmallows and white chocolate and stir until melted and mixture is smooth. Immediately pour fudge into greased pan and let stand about 10 minutes until top is firm to touch. Using a knife, score top of fudge to make fudge squares. Refrigerate about 1 hour. When cool and firm, cut out fudge.